Metalloids are also sometimes referred to as semimetals, owing to the fact that metalloids have properties which are in-between metals and nonmetals. This is in accordance with their position on the periodic table of the elements, where they are found between metals and nonmetals. Most metalloids have the following properties: they have nonmetallic chemical properties, they are more brittle than metals, they are less conductive than metals, and they have a similar appearance to metals. 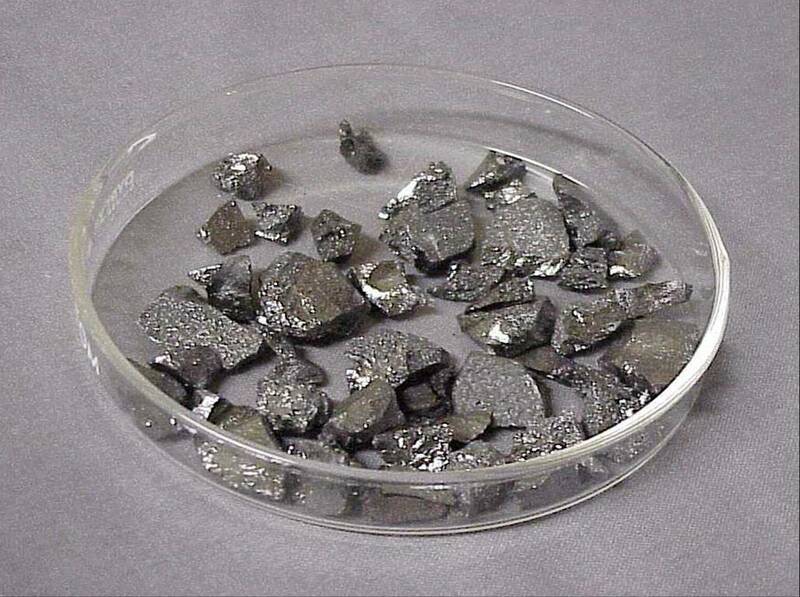 Metalloids/semi-metals have other properties such as the ability to form alloys when they are combined with metals, the fact that they are (in general) good semiconductors, the fact that they are usually solid under normal atmospheric conditions, and typically display a chemical response like those of nonmetals when used in a chemical reaction. To better understand how metalloids/semi-metals are distinct from both metals and nonmetals, let’s begin by exploring their position on the periodic table of the elements. The semimetals/metalloids are found on the periodic table between the nonmetals and metals. The elements found in this medium region have properties which are between metals and nonmetals. There is debate regarding how metalloids are classified, with different systems of classification defining different elements as semimetals. Despite there being different methods of classification for metalloids, we can identify some general examples of metalloids. Boron, silicon, arsenic, germanium, tellurium, antimony, polonium, and astatine. Element 117, Tennessine, is a potential candidate for being a metalloid, though it has not been observed in sufficient quantities to classify it in one way or another. Elements found around it on the periodic table frequently have metalloid characteristics. Because of this, some scientists may choose to classify it as a metalloid. 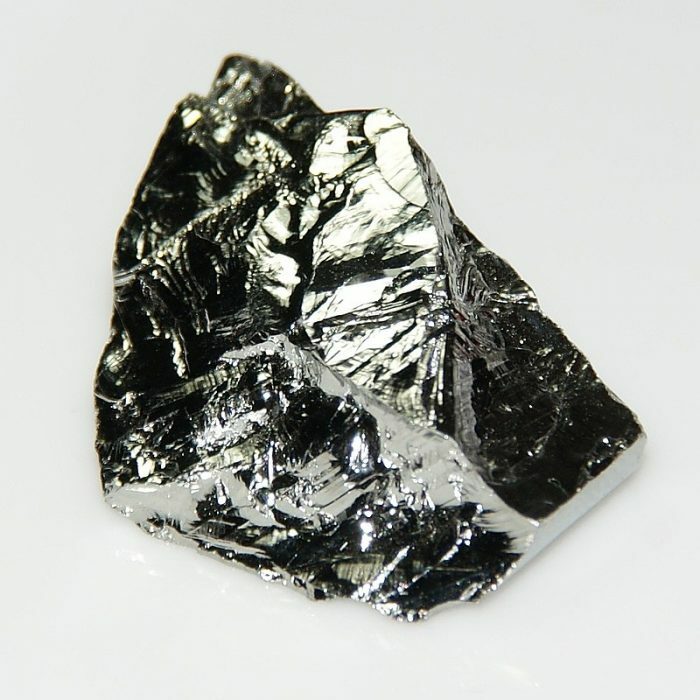 One example of an element which could potentially be classified as a semimetal is carbon, which may have metalloid properties depending on the allotrope. For instance, carbon in a diamond form operates similarly to nonmetals, but in a graphite, form carbon has metallic properties. Graphite is capable of functioning as an electrical semiconductor, and it has a metallic sheen, unlike a diamond. There are other elements which have allotropes that can have nonmetallic or metallic properties. Phosphorous and oxygen can also be considered either nonmetallic or metalloid in nature. In environmental chemistry, selenium is frequently classified as a metalloid. There are other elements which could be considered metalloids. Under the right conditions, elements like hydrogen, sulfur, nitrogen, radon, iodine, bismuth and zinc are considered to be metalloids. As you may have expected by now, semimetals/metalloids have ionization energies and electronegativity levels between those of metals and nonmetals. These intermediate element properties mean that metalloids have characteristics of both metals and nonmetals. As an example of an element with intermediate properties consider silicon. While silicon tends to be an inefficient conductor, and quite brittle, it has a sheen characteristic of metallic elements. The elements that a metalloid reacts with alters how the metalloid responds to the interaction. For instance, boron reacts like a nonmetal when combined with sodium, but when it reacts with fluorine it displays reactions characteristics of metals. The melting points, boiling point, and density of metalloids vary widely across the metalloid spectrum. Finally, metalloids typically make good semiconductors since they have a level of conductivity intermediate of metals and nonmetals. Ionization energies for metalloids are found in between metals and nonmetals, and similarly, the electronic negativities of metalloids are between metals and nonmetals. Metalloids/semimetals possess some characteristics of metals and some characteristics of nonmetals. Metalloids are good semiconductors in general. The reactivity of metalloids is dependent on the elements they are interacting with, and the properties of the other element can make the metalloid display more metallic behavior or more nonmetallic behavior. Metalloids usually have a luster much like metal compounds, but specific allotropes of metalloids may be nonmetallic in appearance. Metalloids are usually solid, and only on rare conditions will they transform into non-solid states. Metalloids are usually quite brittle in comparison to nonmetals. Metalloids can be combined with metals to create alloys, and in chemical reactions, they typically behave as nonmetals. When metalloids oxidize, they often form gases. Metalloids can be used to produce metal alloys by being combined with metal elements. The allotropes of metalloids can be either nonmetallic or metallic in nature. Some metalloids contract when they melt. Metalloids can form a variety of compounds by interacting with other elements. Now let’s examine the physical properties of metalloids. Physical properties are characteristics that can be observed or documented without changing how with the molecules in a substance are grouped, without altering the chemical makeup of that substance. Physical properties include things like density, freezing point, and boiling point. The physical properties of metalloids include the following: metalloids let an average transmission of heat occur, and they are semi-conductive in nature. Metalloids are also very brittle and possess low elasticity. Metalloids have a metallic luster in general. Finally, metalloids are typically in a solid state of matter, being in nonsolid states only under rare conditions. Metalloids have a crystal structure. This crystal structure is the result of covalent bonding. The crystal structure gives metalloids certain physical properties, and elements like germanium, antimony, arsenic, silicon, and tellurian all have a lustrous shine to them. When germanium and silicon undergo crystallization they form a structure like a diamond. The atoms present within this crystal structure possess covalent bonds, and these bonds adhere them to four atoms surrounding them, constructing a tetrahedron shape. Large three-dimensional molecules are stitched together to form single crystals of silicon and germanium. The most stable allotrope of arsenic possesses a layered structure, with sheets of arsenic atoms on top of one another, although arsenic also has several other allotropes which are less stable. Arsenic atoms have a bonding structure that links them to three other atoms in the vicinity. Arsenic and antimony both have chemical structures similar to the chemical structure of graphite, which has a lattice shape. Crystals of tellurium are made out of spiral chains of atoms. The crystal structure of boron is transparent, and it creates icosahedra where borons are found on every corner of the structure. Boron-boron bonds are extremely tight and close together, only around 176PM in length, and this tight grouping of boron bonds also happens to be the most common arrangement for the boron atoms. The boron atoms can be arrayed in many different formations to construct variations upon of the icosahedra form. Silicon joins together with oxygen atoms to create bonds in the following format: si-o-si. Thanks to the chemical properties of both oxygen and silicon, these bonds are created very easily and they are supremely important in the creation of many different minerals. The importance of si-o-si bonds in the creation of minerals can be considered analogous to the importance of carbon bonds in the creation of the organic compounds found in all animals and plants. The elements silicon and oxygen are the most abundant elements in the crust of the Earth. Silicon is the second most abundant element, while oxygen is the most abundant element. Metalloids like arsenic and polonium are highly toxic. Metalloids like silicon are of great importance to the electronics industry, being used to create computer chips necessary for many different electronics. Greater flexibility and other properties can be added to alloys with the introduction of tellurium and antimony. The left side and middle portion of the periodic table is home to the metals. There are a few different groups of metal elements, including Group IA and Group II which contain the Group IA metals and Group IIA metals. There is also a set of transition metals located from Groups IB to VIIIB on the table. 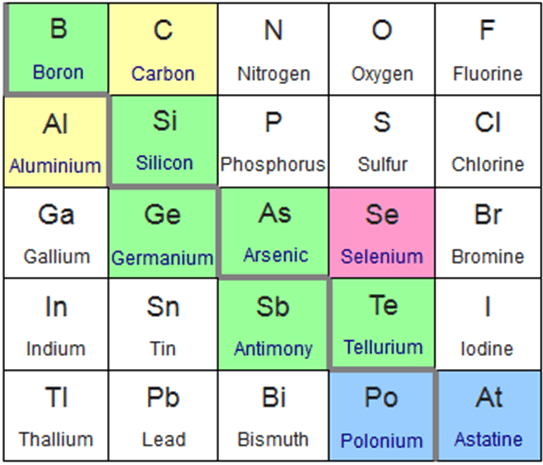 The bottom two rows of elements are metals, although the primary metals are found to the right of the transition metals. Metals are almost always solid at room temperature, but mercury is the exception to this trend. Metals are also dense and shiny. They have high melting points and they also have high densities. Metals possess the following elemental attributes: low ionization energies, large atomic radii, and low electronegativity. The electrons in the valence shell of metals can easily be removed thanks to these properties. Metals are quite malleable, able to be reformed, physically altered, without breaking or changing their chemicals bonds. Metals are good conductors of electricity and heat because of the ability of the valence electrons to move rather freely. The right side of the periodic table is home to the nonmetals. Nonmetals cover many different types of elements: halogens, noble gases, and elements like hydrogen (found on the left side), oxygen, carbon, selenium, sulfur and phosphorous. Nonmetals possess high ionization energies as well as high electronegativity. Nonmetals are poor conductors of both heat and electricity, in contrast to metals. Solid nonmetals are usually quite brittle and they have little or no luster. Compared to other kinds of elements, nonmetals can easily gain electrons.